Address: No 85 - Ma May Str - Hoan Kiem Dist - Hanoi - Vietnam. 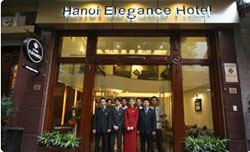 Opened in October 2008, this hotel is the latest addition to the Elegance Hotel group providing fine accommodation as part of our Hanoi Elegance chain. 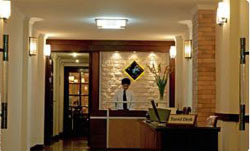 Conveniently located in the very heart of the charming historic Hanoi Old Quarter, at No. 3 Yen Thai street, linked to the bustling Hang Manh street, our hotel is situated in a quiet peaceful corner which offers you a perfect retreat from the vibrant and buzzing Old Quarter. All shopping and banking facilities, as well as eating and entertainment options are located conveniently on our doorstep or just a few minutes walk away. The new Hanoi Elegance 4 hotel provides you with a comfortable and relaxing stay in well appointed rooms furnished with the latest facilities and we maintain our renowned world class customer service. Whether you are on a business trip or a leisure vacation, our 24-hour on duty courteous, professional and friendly hotel staff will take the utmost care during your stay to ensure you have a memorable time in Hanoi.